There's been a lot of negativity lately. We're in the midst of the winter that just won't end, and between stressing about celiac life and life in general, it's easy to get bogged down in the bad. So I think it's a perfect time to participate in something just plain good! Katie over at Live Life Half Full has started Take Time Tuesdays, and I encourage y'all to take part. 1. The new bloggy friends I met when Kelly hosted a workshop on Sunday. Not only did I learn more about the blogging culture, I got to meet some pretty swell ladies! Thanks to Katie, Marcia, Emily, Maggie, Erica, Lauren, and of course, Kelly, for letting me hang out with you guys (and not making me run:)). 2. The totally AMAZEBALLS gluten-free community I am a part of. Seriously. You guys all rock. 3. Clearance wine. I think that's pretty self-explanatory. 4. The nerdgasm brought on by a week of Game of Thrones and Walking Dead marathons. Goodbye, productivity. I'll see you next week. Maybe. 5. Animals doing funny things. 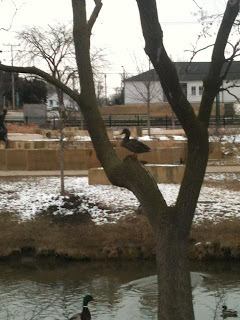 Like this duck in a tree. I'm not sure why this is cracking me up so much today, but I thought I'd share. Alissa, it was so great to meet you this past weekend! I am all about Riesling wines. They are my favorite! 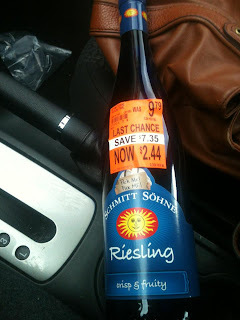 And you gotta love clearance wines! I got a serious kick out of that duck! He made my day! Thanks for joining in! I hope you enjoyed it and will come back next week! And it was so good to meet you! I love the idea of taking time to be grateful. Looking forward to next week! Thank you again for coming, dollface, it was awesome! We really have to do this more often. Ha, I love it, a wine challenge! I could definitely get on board with that! I enjoyed meeting you and am looking forward to your guest post. I am grateful that all of the running talk didn't scare you away. I can't wait to guest post:) It takes more than running talk to send me, um, running. Clearance wine for the WIN! Winter is coming! I can't wait to make gluten-free Game of Thrones snacks this weekend.